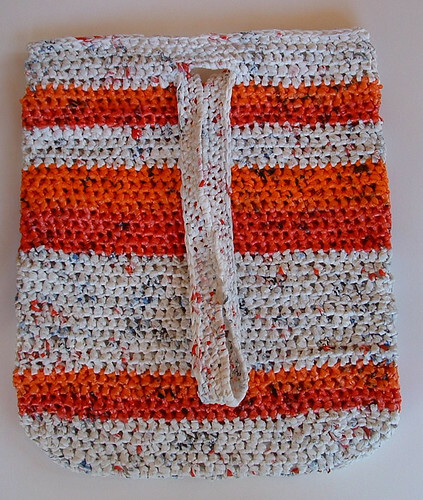 I crocheted this pink and orange striped tote bag from recycled plastic bags. The pink and orange bags are newspaper bags and the white bags are just normal plastic retail sacks. As most people know, white bags are abundant while its hard to find colorful bags but I’m lucky to obtain the pretty pink and orange bags from my local library. They save the bags that they receive their daily newspapers in and I collect them weekly. I used my jumbo plarn beach bag pattern to crochet this bag with just a few minor changes from the original pattern. My base was a chain of 30 as I didn’t want quite as large a tote bag for this project. I also just crocheted 41 total rounds. The result is a tote bag that measures 14-1/2″ wide by 17″ long with a 30 inch long pull-through strap. You can check out my plarn making tutorials here whether you are using newspaper plastic bags or regular plastic bags to create your plastic bag yarn. This tote bag makes an excellent market bag as the long strap can be slipped over your shoulder or looped around your hand for carrying. 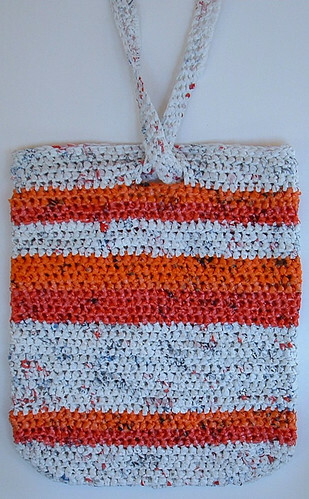 You can craft this tote bag project or if you aren’t a crocheter, my pink and orange recycled plastic tote is for sale here. Beautiful bag. Worth giving a try. And cudos to you for the environmental initiative ! !